Volunteers assess the dog food donations Thursday at the La Plata County Humane Society. The Humane Society was forced to stop accepting donations because of the generous amount it had received. The La Plata County Humane Society accepted donations on Thursday, including this collection of dog kennels. 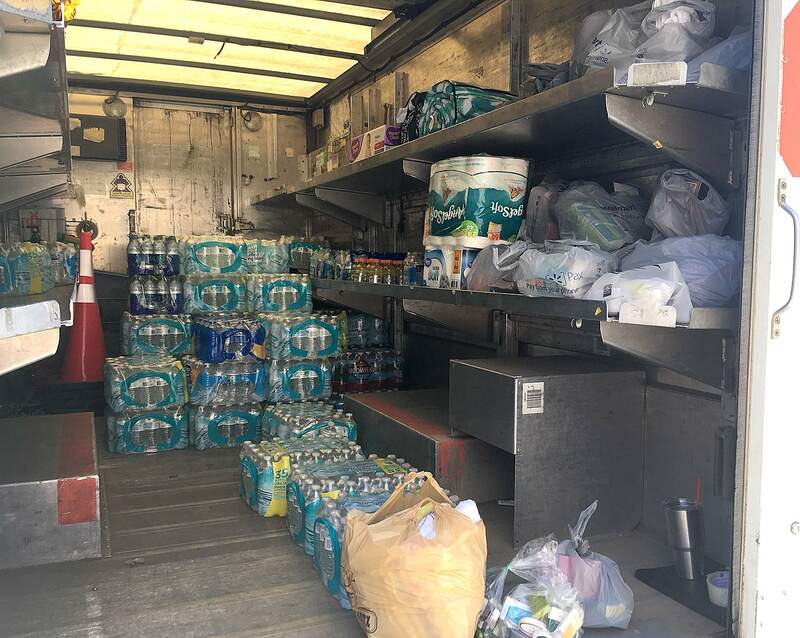 Donors filled a truck filled with supplies for fire evacuees outside of Walmart. Numerous passers-by bought water, toiletries and other supplies to donate to the evacuees. The Durango community came together Thursday to donate an abundance of items to those displaced by the Lightner Creek Fire. X Rock Durango set up three vans around the city to accept donations from the community that were delivered to the Red Cross on Thursday evening. One truck was outside Walmart, one in the Town Plaza parking lot and one outside the Rusty Shovel Saloon in Bayfield. Numerous community members also donated items directly to the evacuation center, mostly in the form of beverages, snacks and toiletries. “We’ve had a pretty good flow of donations all day,” Noah said. Meals were provided by local restaurants at the evacuation center, and the Red Cross wants to implement a food voucher plan with local restaurants for evacuees, Noah said. Ideally, restaurants would provide $10-15 vouchers for evacuees. The Red Cross would manage the vouchers and give them out to people who need them. The food distribution plan has not been tried by the local Red Cross before, so the group is not certain it will be implemented. “Gift cards, however, can be a great donation, which is pretty much the same thing,” Noah said. The Red Cross doesn’t record how many donations it receives. Noah estimates it has roughly a day and a half’s supply of water and snacks, mostly coming from donations. Most of the food donations have been grab-and-go snacks. Community members interested in donating can bring them directly to the evacuation center at Escalante Middle School, 141 Baker Lane. Some evacuees had high praise for the Red Cross volunteers helping at the center. “They’ve gone out of their way to make us very comfortable and get us what we need,” said Clyde Doney. The evacuation center moved from the La Plata County Fairgrounds to the middle school Thursday. The school does not allow pets, so the La Plata County Humane Society closed adoption services while it houses evacuated pets. As of 5:30 p.m. Thursday, 17 dogs owned by evacuees were housed at the Humane Society. The Humane Society will not turn evacuees’ pets away. 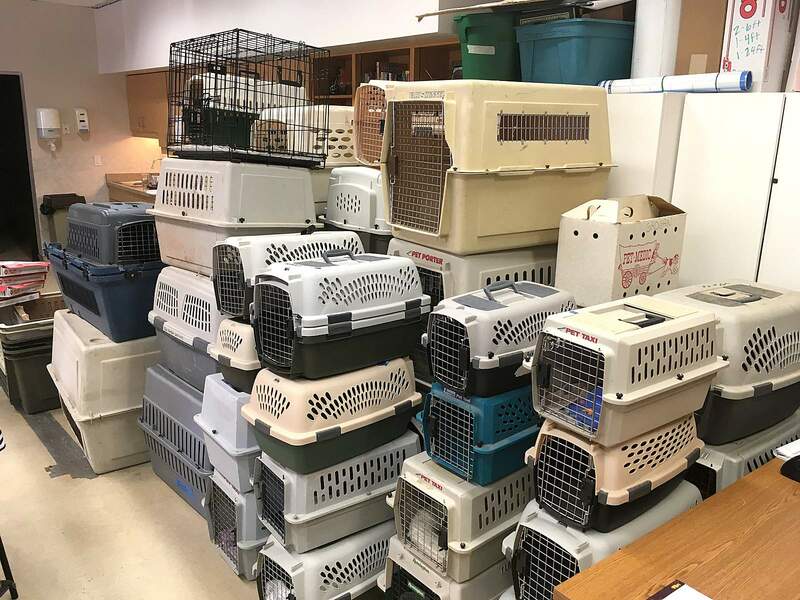 If spaces fill up, the shelter will plan to transfer the Humane Society’s own sheltered animals to different locations. 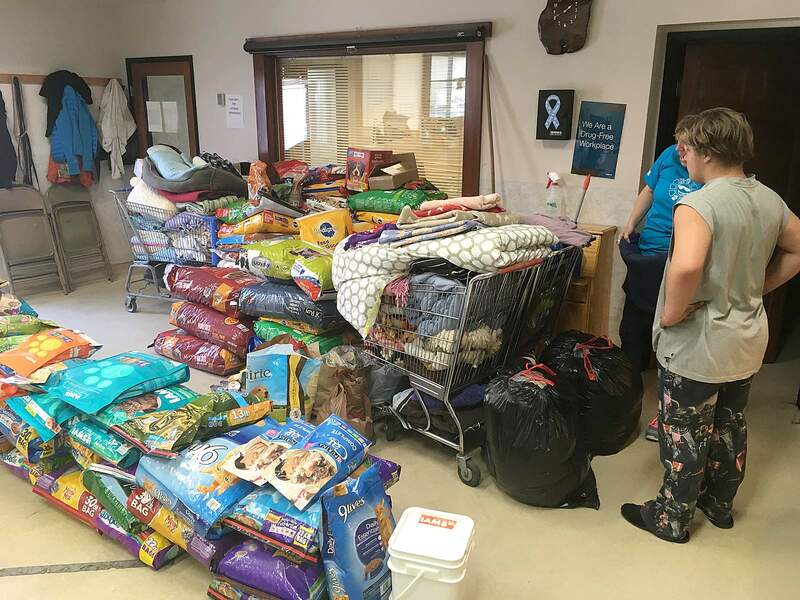 The Humane Society also accepted donations for the pets, including food, kennels, toys and water dishes. It received so many donations throughout the day that it was forced to stop accepting them. The Humane Society is now focused on reaching out to evacuees to inform them of the available donations.